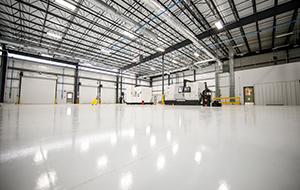 30,000 square foot manufacturing facility encompassing roughly 27 acres of a 740-acre mixed-use development. The property is adjacent to Interstate 65 at Exit 57, in a fast-growing area. The project has led to at least $4 million in infrastructure development by the city and state in addition to bringing a road and utilities to the area for the creation of an industrial business park. Brown Precision anticipates an additional $3MM equipment investment within the first three years of operation. Brown Precision, Inc., a Huntsville, Alabama based company providing precision machining for the aerospace and medical industries planned to open a new 30,000 square foot manufacturing facility in Southwest Alabama. 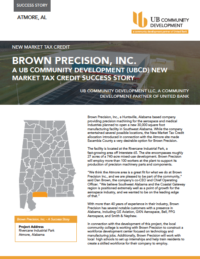 While the company entertained several possible locations, the New Market Tax Credit allocation introduced in connection with the Atmore site made Escambia County a very desirable option for Brown Precision. 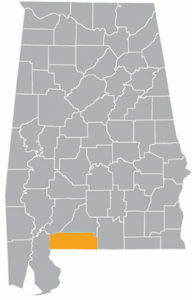 The facility is located at the Rivercane Industrial Park, a fast-growing area off Interstate 65. The site encompasses roughly 27 acres of a 740-acre mixed-use development. Brown Precision will employ more than 100 workers at the plant to support its production of precision machinery parts and components. With more than 40 years of experience in their industry, Brown Precision has several notable customers with a presence in Alabama, including GE Aviation, GKN Aerospace, Bell, PPG Aerospace, and Smith & Nephew. In connection with the development of this project, the local community college is working with Brown Precision to construct a workforce development center focused on technology and manufacturing jobs. Additionally, Brown Precision will work with local high schools to set up internships and help train residents to create a skilled workforce for their company to employ. This project has led to at least $4 million in infrastructure development by both the city and state. These improvements include bringing a road and utilities to the area for the creation of a new industrial business park. Within the first three years of operation, Brown Precision anticipates an additional $3 million equipment investment to be made. UB Community Development, a community development partner of United Bank is dedicated to meeting the needs of our community. UB Community Development serves communities throughout Alabama and beyond by providing funding solutions designed to increase economic development, create jobs and promote better access to goods and services. UBCD is currently using its NMTC allocation and Community Facilities Lending Program to fund businesses and finance projects related to education, healthcare, manufacturing, hospitality, non-profits, community centers and more. In 2016, United Bancorporation of Alabama became the only CDE headquartered in Alabama to receive a New Market Tax Credit allocation. This $65MM allocation was made possible because of United Bank’s designation as a Community Development Financial Institution (CDFI) and UBCD’s designation as a Community Development Entity (CDE) with a mission to bring economic viability to rural areas. In 2017, following the successful deployment of more than $90MM in New Market Tax Credits, UB Community Development received an additional $55MM allocation of New Market Tax Credits. UBCD also manages $40MM of funding as part of its Community Facilities Lending Program, as well as a $4MM Capital Magnet Fund award. These allocations further validate our team’s extensive expertise and passion for bringing community oriented economic development projects to qualifying areas. UB Community Development’s strong history as an experienced leverage lender in New Market Tax Credit transactions, coupled with our passion for improving the communities around us, make UBCD Alabama’s premier financial partner for rural economic and community development. Download the success story here. UB Community Development is dedicated to meeting the needs of communities. UB Community Development LLC (UBCD), a community development partner of United Bank, serves low-income communities throughout Alabama and beyond by providing funding solutions designed to increase economic development, create jobs and promote better access to goods and services. Our New Market Tax Credits and Community Facilities Lending Program loans are being used to help finance projects related to education, healthcare, manufacturing, public works and more. UB Community Development LLC (UBCD), a community development partner of United Bank, is dedicated to continuing United Bank’s strong history of serving communities across Alabama and Florida for nearly twelve decades. Whether your goals include funding a community development project, improving essential community facilities, expanding your business or accessing increased capital, UBCD offers a variety of lending solutions to help you meet your goals.